Haridwar is also spelled “ Hardwar ” is an ancient city in the Haridwar district of Uttarakhand, India. The River Ganga, after flowing for 253 kilometres (157 miles) from its source at Gaumukh at the edge of the Gangotri Glacier, enters the Indo-Gangetic Plains of North India for the first time at Haridwar, which gave the city its ancient name,Gangadwára. Haridwar is regarded as one of the seven holiest places (Sapta Puri) to Hindus. According to the Samudra manthan, Haridwar along with Ujjain, Nashik and Prayag (Allahabad) is one of four sites where drops of Amrit, the elixir of immortality, accidentally spilled over from the pitcher while being carried by the celestial bird Garuda. This is manifested in the Kumbha Mela, which is celebrated every 12 years in Haridwar. 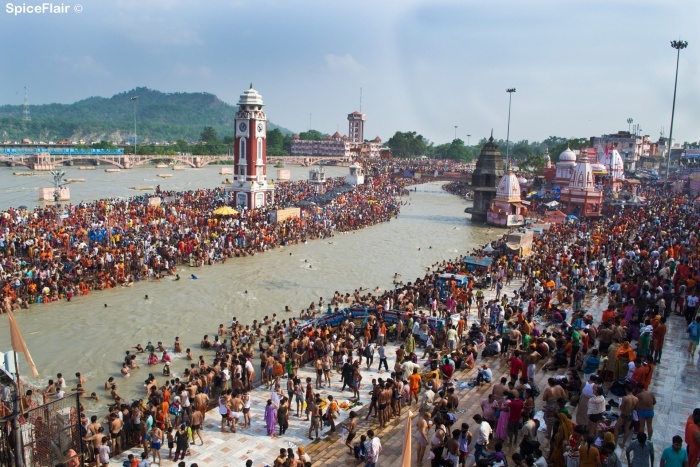 During the Haridwar Kumbh Mela, millions of pilgrims, devotees, and tourists congregate in Haridwar to perform ritualistic bathing on the banks of the river Ganges to wash away their sins to attain Moksha. Brahma Kund, the spot where the Amrit fell, is located at Har ki Pauri (literally, “footsteps of the Lord”) and is considered to be the most sacred ghat of Haridwar. In the scriptures, Haridwar has been variously mentioned as Kapilasthana, Gangadwara and Mayapuri. It is also an entry point to theChar Dham (the four main centres of pilgrimage in Uttarakhand viz, Badrinath, Kedarnath, Gangotri, and Yamunotri), hence, Shaivaites(followers of Lord Shiva) and Vaishnavites (followers of Lord Vishnu) call this place Hardwar and Haridwar respectively, corresponding to Hara being Shiv and Hari being Vishnu. The legendary King, Bhagiratha, the great-grandson of the Suryavanshi King Sagar (an ancestor of Rama), is said to have brought the river Ganges down from heaven, through years of penance in Satya Yuga, for the salvation of 60,000 of his ancestors from the curse of the saint Kapila, a tradition continued by thousands of devout Hindus, who brings the ashes of their departed family members, in hope of their salvation. Lord Vishnu is said to have left his footprint on the stone that is set in the upper wall of Har Ki Pauri, where the Holy Ganges touches it at all times. Haridwar came under the rule of the Maurya Empire (322–185 BCE), and later under the Kushan Empire (c. 1st–3rd centuries). Archaeological findings have proved that terra cotta culture dating between 1700 BCE and 1200 BCE existed in this region. First modern era written evidence of Haridwar is found in the accounts of a Chinese traveller, Huan Tsang, who visited India in 629 AD. During the reign of King Harshavardhan (590–647) records Haridwar as ‘Mo-yu-lo’, the remains of which still exist at Mayapur, a little to the south of the modern town. Among the ruins are a fort and three temples, decorated with broken stone sculptures, he also mentions the presence of a temple, north of Mo-yu-lo called ‘Gangadwara’, Gateway of the Ganges.